Wow, it's been a while since I last posted. Since then I started working at Google, made a ton of hardware projects for the Acorn series of computers: Electron, BBC Micro, BBC Master, and have enjoyed a year and a half of marriage. I spent a week in New Zealand visiting family for Christmas. My main project while there was to clean up a whole lot of stuff I left behind when I moved to the USA, which, among a whole lot of physical stuff like university notes, included various hard disks, and several hundred floppy disks in various formats. Most of them were 1.44M DOS disks, but the most interesting ones (because I was hoping to find traces of the earliest programs I'd written, in the 80s) were in various Acorn formats like 320k ADFS and 200k DFS, as well as the newer 800k and 1.6M ADFS. Luckily it appears that the last desktop computer I bought, an Athlon XP machine from 2005, was capable of reading *all* the formats. As confirmed by Andrew Benham in London, the libdsk project and its dsktrans tool work really well and can autodetect all the formats I was interested in. I never needed to specify -format; I experimented a bit with some unknown disks, but it looks like the ones that dsktrans couldn't autodetect were unreadable using any of the formats I tried. I assume the ADFS approach will also work for DFS, but either I haven't found an emulator that understands 3.5" DFS disks yet, or my disks were too damaged. If you know nothing about Burning Man, start by reading everything you can on the official Burning Man site, but especially the preparation page and the 10 principles. I'd highly recommend watching Spark: A Burning Man Story too; you can stream it on Netflix. In a nutshell: Burning Man is a week long party in the Black Rock Desert, to the north of Reno, Nevada. It runs for about a week, ending on Labor Day: in 2016 it's Sunday August 28 - Monday September 5. It's a festival of some sort, except all the entertainment comes from the participants; there aren't any "official" acts, but hundreds of groups of determined campers make amazing art and throw parties large and small, so it feels less like a music festival and more like you've stumbled upon some foreign-but-familiar city filled with hedonistic artists and house party hosts. Some jargon: "Burning Man" is the event, "Black Rock City" is the place. If you attend Burning Man, you're a "burner", and BM is typically referred to as "the burn". The desert floor is called "the playa", and the ever-present beige dust is "playa dust". When you or your car or your stuff is covered in enough of it, you're "playafied". I highly recommend trying to catch as much of the event as possible; I've always gone in on Monday or Tuesday, and left on Labor Day. If you can't spare that much time, you can trim a little off each end of the week: you could probably feel pretty satisfied coming in during the day on Wednesday and leaving early Sunday morning. Wednesday night is a big party night, as are Friday and Saturday. I personally love staying for Sunday night; while there's less to do during the day as many camps start packing up early Sunday morning, the Temple Burn that evening is beautiful, and the departure line ("exodus") is much shorter on Monday morning. Ticket: you need one to get in. They cost about $400, plus another $80 or so for your car. It's not the end of the world if you don't have one yet, but you will have to hustle. Transport: how are you getting there? Do you have your own car, or are you going to rent one or drive with friends? Are you renting an RV to sleep in, or do you just need something big enough for you and your gear? Friends: who are you camping with? You probably want to join a pre-existing camp. If you don't know any burners, it's time to start making friends! Those are your priorities right now. Less critical, but still important later on, are the details of how you'll survive the event itself. The main ticket sale is over now, which means ticket availability will be pretty scarce for the next little while. Ask around in case one of your friends picked up more tickets than they needed, though. Some camps are permitted to pre-purchase tickets (because the Burning Man Organization wants to make sure they can attend), so your camp organizer may be able to point you in the right direction. Failing that, when tickets start hitting mailboxes around July, they'll also start showing up on Craigslist. Right before the event, there's an "OMG Sale", which releases a few thousand more tickets onto the market. If you're camping in a tent (which doesn't have to be so bad -- I'll be writing another post with details on how I do it relatively comfortably), you just need a ride for you and your gear. You'll end up with a surprising amount of stuff; I've never ended up with spare room in a car after packing two people, their gear, and their bikes, especially once you include food and ~18 gallons of water per person. If you're planning on renting an RV, enquire now. I looked into it in December and found that the cheapest RVs available were around the $5000 mark -- it seems that taking an RV is now an expensive luxury. If you don't mind adding 10 hours to the drive, you can save some money by renting in LA or Las Vegas instead of San Francisco or Reno. Renting a car will cost you ~$600 with all the insurance, and you'll need a bike rack also. If you have a brand new car that you can't stand to get dirty, you probably don't want to take it (because it'll smell like playa dust for up to a year afterwards), but the playa-inflicted damage isn't that bad; it's probably equivalent to a couple of years of ski trips. I rented an ordinary compact from various rental agencies in 2010, 2011, and 2012, and it was a little cramped, but worked just fine -- although you'll save on time and stress during the packing process if you rent a bigger car. There are various other options available to you if you have someone to haul all your gear, and possibly all your food: buses, trains, and planes! Burning Man runs the official Burner Express bus all the way from San Francisco to BRC, and also for the short hop from Reno to BRC. It has its own entry line, so you get in much faster than driving, except your luggage is limited to one or two suitcases. This is probably an excellent way to get in solo, as long as you have transport for your bike (or you rent one from Playa Bike Repair). Consider also mixing it up: Last year one campmate packed his bike and cooler in our camp trailer, took Amtrak from SF to Reno last year (and loved it! ), then joined other campmates in their RV from there. Finally, the luxury option is to catch a small plane from Reno airport directly in to BRC; this will set you back about $1000, but is by far the quickest way to get in and out, and the view is amazing. Unless you really like roughing it, it's essential to join a pre-existing camp that has done this before and is fairly good at it. A really organized camp will have a generator, trash disposal, greywater disposal, a shower or two, perhaps their own porta-pottie, a kitchen with a grill or two, a chill space, and a public space. IMHO the absolute minimum for comfort is: a shower, good greywater disposal (so individuals don't have to haul their dirty shower water home), and a chill space. For friends who are camping with us: the camp I'm part of has a shower, workable greywater disposal, some solar panels and car batteries for lighting, a kitchen dome, and a really nice chill area out front. Some campmates put together a giant trampoline type hammock every year, and we also have a dome full of chairs to hang out in during the day. We also have no camp dues, and nobody will yell at you if you don't do any work (but folks who do help out will be remembered when it comes to allocating pre-sale tickets the following year). That's all for now... the next blog post will be about tents and bikes, I imagine! 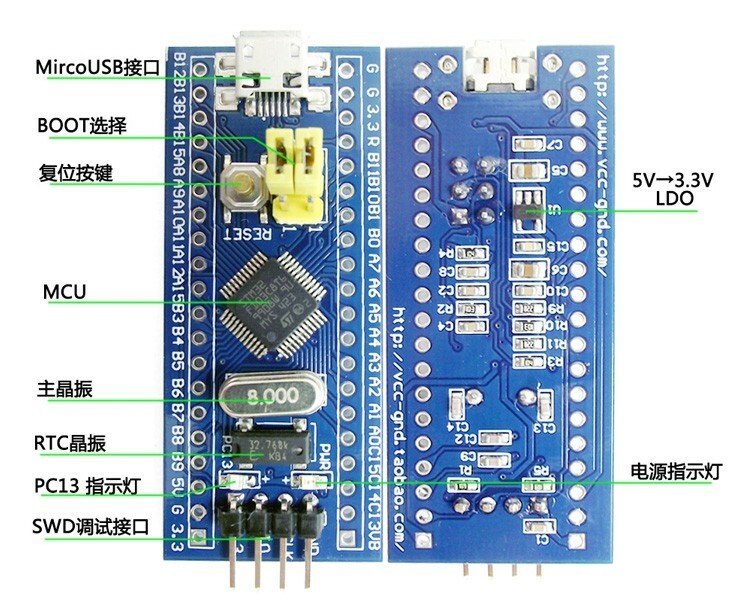 I recently ordered a bunch of STM32F103 boards from China. They have a rectangular footprint like the Teensy or Arduino Micro, and a 48-pin STM32F103C8T6 MCU on board -- a 72MHz Cortex-M3 with 64kB of flash and 20kB of RAM. It's just the single MCU chip on board, with a bootloader, and the SWD pins brought out to a header, which should make it quite flexible; I'll be able to program/debug them with Eclipse and OpenOCD if I want full control, or I can use the STM32duino Arduino port if I just want to push code to them. The best part is that they only cost $2.25 each on Aliexpress, or about $3.50 on eBay, which is about half the cost of the chip alone when bought in the US. These should be good for controlling LEDs over USB, or for soldering into projects where I feel that a Teensy would be too expensive. While I am so happy to have my J-Link back, the couple of weeks without it have been very productive in terms of open source contributions. After finding out that OpenOCD didn't support raw JTAG mode on CMSIS-DAP adapters, I bit that off as a potential project, and eventually got it working, then did some performance tuning, and I'm pretty pleased with it now. With my LPC-Link2, it can program the flash in an ATMEGA32U4 over JTAG at about 1/4-1/3 of the speed of the J-Link (which is kind of a speed demon). I'm going to let it soak on GitHub for a while, then clean it up and submit it to OpenOCD once it's had a bit of scrutiny. → Clone myelin/openocd and check out the cmsis-dap-jtag branch to try it out. Implementing this required getting pretty familiar with the CMSIS-DAP source code and protocol, and at some point I realized that it wouldn't be super hard to port the SWD/JTAG debugger part of the CMSIS-DAP firmware over to any USB capable microcontroller. Full CMSIS-DAP support requires the debugger part, plus a serial port and a mass storage device emulator that's also capable of flashing a .bin file to a chip, but I'm not doing this to provide a USB interface to a custom board (like the ones on the mbed site), so I've skipped those two. I'll probably add in the serial port sometime, because I wrote serial bridge code for teensy-openocd-remote-bitbang already. The _OUT functions (e.g. PIN_SWDIO_OUT) take a uint32_t with a boolean value in the LSB, but often junk in the higher bits. A 32-bit processor is expected, so there was one point where I needed to add (uint32_t) casts to avoid losing the high bytes of a word. → So here's CMSIS-DAP firmware for your Pro Micro (ATMEGA32U4) or Teensy 3.2 (MK20DX256) board. I've been doing quite a bit of fabrication work at Noisebridge over the last year or so -- mostly electronics, plus a bit of 3D printing. One bit of equipment I've been interested in for a while is the MaxNC 10 CNC mill, which has been covered by a sheet for a while and appeared out of order, but has recently been unearthed and looks a bit happier. I gave it a try tonight, and it looks like it should be usable! It's controlled by a computer under the desk running an ancient version of Ubuntu, with a realtime kernel for the control software. Booting it up and double-clicking the maxnc10ol link on the desktop brought up LinuxCNC. Flipping the red switch on the mill brought it to life, and the machine started up properly after hitting F1 then F2. When homing axes, you can only move an inch in the 'negative' direction before the software will stop you -- need to rehome the axis (redefine your negative position as 0) then hit F1 twice and F2 again, then you can move it another inch. So it took a few tries to get the machine to move far enough to the left (moving the platform over to the right), and a couple to get the Y axis homed. Once the spindle looks like it's in a safe place, you can run your program with Machine | Run Program. This will start the spindle and move through the program, then stop wherever it finished. It happily ran through its demo program. The mill is a little small for the sorts of things I have in mind (large wooden boards cut in interesting shapes, like a lot of art at Burning Man these days) but could work nicely for PCB milling -- someone at Noisebridge has had some luck with this -- if I get some cheap PCB blanks from Aliexpress, and a couple of carbide mill bits. I suspect that the sweet spot here would be for very simple single-sided boards which are SMD-only... for example, one-off custom LED fixtures with a string of addressable LEDs and no onboard controller (or a very simple one that doesn't need any complicated traces or small pads -- so my favourite tiny MCU, the MKE04Z8VTG4, would be out, but the SOIC version would be OK, or maybe the 0.8mm TQFP44 MKE*VLD* chips). Good news -- my replacement J-Link is in the mail! Reliable hardware on the way. In the meantime, I'm still working on my CMSIS-DAP adapter and my ESP8266 board. I'd mis-soldered a 10uF capacitor between TCK and ground (instead of 3V3 and ground), which was stopping anything from working, but after hooking my Saleae box up to the board, I debugged that fairly quickly. I fixed some bugs in the code, but OpenOCD still failed to do the initial chain scan, so something's still broken. To debug this, I changed tack: OpenOCD also has a "remote_bitbang" driver, where it sends a series of ASCII characters to a TCP socket, to drive a very very simple JTAG adapter. This sounds like a recipe for the worst JTAG performance ever, except that the Teensy 3.2's serial-over-USB performance is very very good, and I saw some pulses as short as 2us in the logic capture, so this should be able to get me ~250 kbit/s, which is certainly good enough for now. Unfortunately OpenOCD *still* couldn't scan the JTAG chain, and it did get bits out TDO this time, so that hardware is not completely broken, but I still have some debugging to do. Update: I suspect TDO is in high-impedance mode -- it looks like it's floating around 1.5V. Perhaps the ESP8266 doesn't enable its JTAG pins while in reset? Either that or maybe I need to program the chip with code that enables the JTAG pins. Update 2: Got it working! It turns out that my understanding of remote_bitbang's reset signals was the wrong way around -- RESET is active-low electrically, but the remote_bitbang protocol spec assumes active high. So "reset=0" means 3v3 on the reset pin, and vice versa. The ESP8266 JTAG pins are high-impedance in reset, which is why I saw TDO floating. This doesn't explain why my CMSIS-DAP code didn't work, but at least now I have a known-good state to compare with. Following up on my last post, I managed to get OpenOCD flashing a Kinetis MKE02Z64VLD2 chip, to the point that I could hook it up to Kinetis Design Studio and program/debug almost as easily as with my J-Link, albeit without unlimited flash breakpoints, and it would often get confused about where it was on startup, although after hitting F8 everything would come back to normal. I posted to the OpenOCD-devel mailing list and got a bunch of responses from others who had been working on the same problem, including Ivan Meleca, who had written a flash driver for the KE02/4/6 series but hadn't had time to upload it. I tested this out tonight on my MKE02Z64VLD2 and MKE04Z8VTG4 boards and it works well, so look forward to seeing that in mainline OpenOCD soon. Ivan's code works, so I don't want to mess with it, but I'm proud of a couple of little tricks I figured out for my own implementation. I wrote a Python script to process the output of arm-none-eabi-gcc -g -O0 -mcpu=cortex-m0plus -mthumb -c -Wa,-adhln, extract out the opcodes, and comment everything up nicely, which lets you build self-contained routines that are easy to download and run on target devices. I'm not sure how everybody else wrote their flasher code, but they all seem to have ended up with slightly differently formatted hex bytes embedded in C files, so maybe by hand? Anyway, my flash algorithms and C-to-assembly-to-C code are up on GitHub as myelin-mcu-flash. Here are some notes from my attempts to get OpenOCD to support the raw JTAG operations in the CMSIS-DAP API, to talk to my ESP8266 board. To get JTAG to work, you need to be able to clock in arbitrary sequences on the TMS pin, and you need to be able to clock in arbitrary sequences on the TDI pin with TMS low, while capturing output on the TDO pin, and setting TMS high as you clock in the final bit. This makes more sense if you look at the JTAG state diagram. 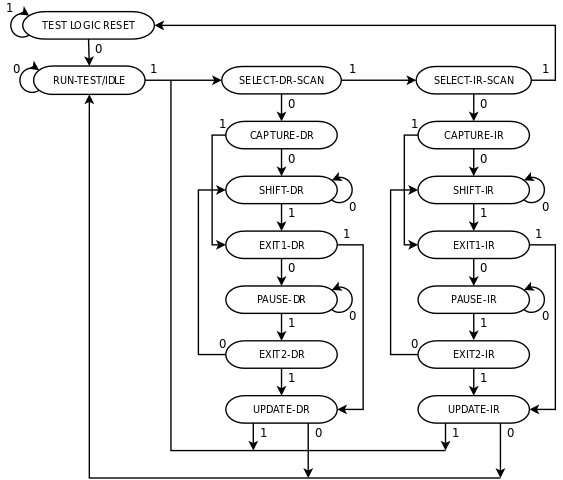 TEST LOGIC RESET resets the test logic. Entering CAPTURE-DR copies data from the device into the DR register, and entering UPDATE-DR copies data from the register to the device. Every entry into SHIFT-DR clocks a bit from TDI into DR (on the rising edge of TCK), and a bit from DR out TDO (on the falling TCK edge). CAPTURE-IR, SHIFT-IR, and UPDATE-IR work similarly. All other states are just intermediaries that make it convenient to navigate around the state machine without needing too long of a sequence on TMS. ID_DAP_JTAG_Sequence, which clocks out sequences on TDI, and optionally sets TMS and captures TDO. The max sequence length is 8 bytes (64 bits), and the sequence info byte is: (0x80 if capturing TDO, else 0) | (0x40 if TMS is set, else 0) | (sequence length in bits, with 64 encoded as 0). This suggests that a 'scan' operation (writing something into the IR or DR register) will require one DAP_SWJ_Sequence command to move the TAP to Shift_IR or Shift_DR and one DAP_JTAG_Sequence command to write the command. We can probably just leave the TAP in the shift state once the command is done, but we could use another DAP_SWJ_Sequence to get back to the idle state if that's not okay. Looking at the bitbang driver, it looks like the desired end state is given in cmd->cmd.scan->end_state, the input and type (input or output) can be obtained via jtag_build_buffer and jtag_scan_type, and it's an IR scan if cmd->cmd.scan->ir_scan is set. The actual scan function moves to the TAP_DRSHIFT or TAP_IRSHIFT state as required, then clocks the data in/out on TDI/TDO, then executes another state_move to get to the desired end state. So I guess we'll actually require three DAP operations to do this, because of the final requirements for TMS (unless we want to try to pack those into the JTAG_Sequence packet). 11pm update: Implemented! It compiles, but I haven't tested it at all yet, so expect many bugs..
My J-Link broke yesterday, so I'm back to using either my FRDM-KE04Z board with USBDM firmware or my LPC-Link2 with CMSIS-DAP firmware to program my Kinetis E devices. USBDM seems to only support Windows and Linux, so I'm trying out the LPC-Link2 with OpenOCD today. My chip is a Kinetis MKE02Z64VLD2 (64 kB flash, 4 kB RAM, 20 MHz max), which OpenOCD doesn't have a flash algorithm for. With any luck it should be able to debug my chip out of the box, but I'm going to have to steal code from USBDM to get it to download my code. Once OpenOCD is running, it listens on ports 3333 (GDB remote protocol) and 4444 (command shell). telnet localhost 4444 gives you something like the J-Link Commander console. 'reset' and 'halt' do the expected things, so it looks like it's handling the SWD protocol just fine. USBDM flashes the KE02 using its Kinetis-FTMRH-flash-program-gcc helper, which is downloaded into the target over SWD, then executed to copy chunks of code from RAM to flash. The metadata mapping devices to flash routines is in arm_devices.xml. It looks like flashing happens via the FlashProgrammer_ARM class: loadLargeTargetProgram loads the flash helper into the target's RAM, and executeTargetProgram runs it. It looks like the target program contains a header, at a known location in its data segment. So it looks like we have all the pieces of the puzzle... the trick will be to get FlashProgrammer_ARM.cpp wired up to OpenOCD's interface code, so it can write and execute code on the target. Hopefully in future I'll be able to program my ESP8266 modules using JTAG, but I have a project from last year which used the ESP8266, didn't bring out the JTAG pins, and tied GPIO15 (TDO) to ground, which means it would require desoldering the ESP-03 module to fix. I programmed it using the ESP8266 Arduino extension and a Sparkfun FTDI Basic Breakout board, which unfortunately doesn't bring out RTS, which meant for a lot of power cycling. To make matters worse, the FT232 seems to crash sometimes when subjected to this sort of thing, losing control of its DTR output and needing power cycling *itself*.